I am one of the organizers of a 3-month semester on quantum information theory ad the Institut Henri Poincaré in Paris. 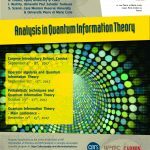 Among other events, there will be a one-week workshop on Probabilistic techniques and Quantum Information Theory, Oct 23-27. Please register if you are interested in attending.